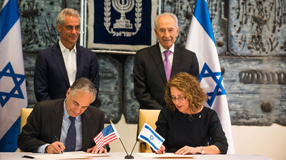 UChicago and Ben-Gurion University will collaborate to apply nanotechnology discoveries that make clean drinking water more plentiful. Poet and essayist Rosanna Warren brings academic mischief to the Committee on Social Thought. Nigel Lockyer, an experimental particle physicist, will succeed Pier Oddone as director of the US Department of Energy's accelerator laboratory. Dinosaur hunter Paul Sereno uses digital imagery to help a 10,000-year-old skeleton stand and walk. Brenna Berman, AB'98, MPP'00, succeeds Brett Goldstein, SM'05, as the city's chief information officer. Want your kids to learn more words? UChicago researchers find that gesturing and pointing out objects helps improve children's vocabulary. A rare exhibit of Norman Parish's work will be the final show at a gallery he has devoted to showcasing other artists. David Brooks, AB'83, takes stock of contemporary humanities education and recalls the passion of late professor Karl Weintraub, AB'49, AM'52, PhD'57. Jean Twenge, AB'93, argues that outdated statistics create unnecessary anxiety about a woman's decline in fertility during her 30s. The CNN special correspondent, a Kovler Visiting Fellow, discusses her life and family, and addresses issues of identity, community, and social responsibility. An early 20th-century student called for Indian independence and Gandhian ideals.